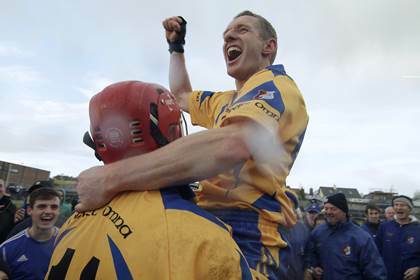 Goals from Joe Canning (free), Andy Smith and Damien Hayes propelled Portumna to Galway SHC glory in Salthill today. A closely contested first half finished with the sides all level but the winners outscored their opponents by 1-7 to 0-3 in the second half to reclaim their place at the summit of Galway hurling and capture the silverware for a sixth time since their inaugural success in 2003. Canning (free) and Smith raised green flags in the first half but with Niall Keary accurate from placed balls, the scoreboard read 2-5 to 0-11 at the half-way stage. There was only one team in it, however, in the second half and Portumna's dominance was rewarded when Hayes finished off a move involving Niall and Kevin Hayes. Canning top scored for Portuma with 1-5, 1-3 of which came from placed balls, while Smith finished with 1-4 to his credit. Loughrea's woes were compounded when Johnny Coen cleared the crossbar with a penalty attempt in the 56th minute. A minute's silence was observed before throw-in as mark of respect to the late Niall Donohue. Portumna - J Keane; M Ryan, E McEntee, G Heagney; C O'Hare, M Dolphin, E Lynch; L Smith, J Canning (1-5, 1-3f); K Hayes, D Hayes (1-1), O Canning (0-1); A Smith (1-5), R O'Meara, N Hayes. Subs: P Smith for L Smith, O Royston for O'Meara, O Treacy for Ryan. Loughrea - N Murray; E Mahony, D McClearn, T Regan; S Sweeney, B Mahony, V Maher; E Mahony, G Keary (0-1); N Keary (0-5, 4f), P Hoban (0-1), J Coen (0-2, 0-1 pen); J O'Loughlin (0-2), J Maher (0-1), J Ryan (0-2). Sub: T Hoban for E Mahony.